Dean Stockwell | El diabolik's World of Psychotronic Soundtracks. Filmbar70 presents the eve of HP Lovecraft! Yes ladies and gentlemen, after the stone groove that was last months film screening and psychotronic disco party, Filmbar70 and el diabolik invite you to rend the veil of reality and spiral into the stygian spaces betwixt the spheres as we celebrate the poet laureate of cosmic horror himself – H. P. Lovecraft. 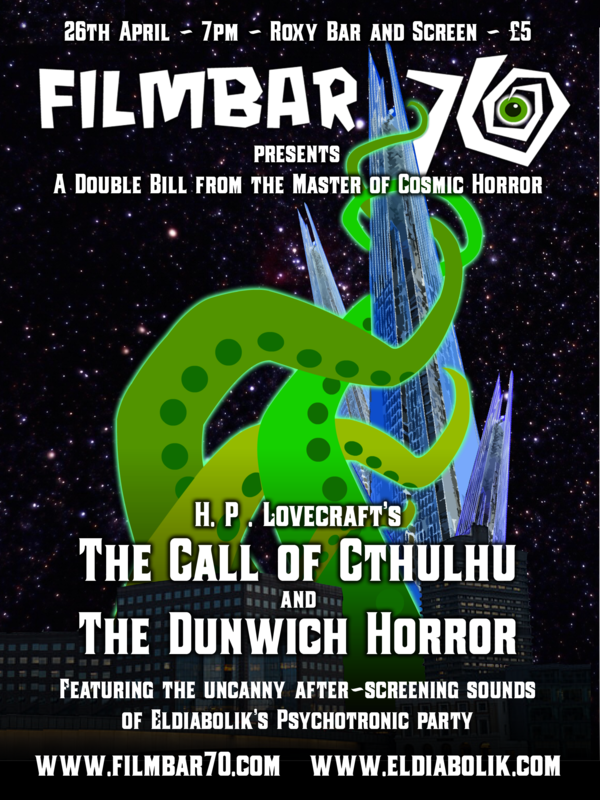 Witness unspeakable horrors emanating from unfathomable voids with the screening of the onl…y two true celluloid adaptations of his work, ‘The Call of Cthulhu’ and ‘The Dunwich Horror’. As always I, el diabolik will be spinning all sorts of psychotronic vinyl throughout the evening.